Runddans has been described as “a spiritual magnusopus", but that may be a euphemistic assessment. When Todd Rundgren dubbed his fourth solo album A Wizard, A True Star it seemed somewhat presumptuous at the time, given that he had only begun recording a scant five years before. Four decades later, that title has come to sum up one of the most remarkably prolific careers in rock’s vast lexicon. There’s practically nothing Rundgren hasn’t done, whether as a performer, producer, engineer or video pioneer since making his bow with his first band Woody’s Truck Stop in his native Philadelphia and then creeping into the national spotlight with the Nazz. Indeed, Rundgren has always freely delved into a dizzying array of musical ventures — from pop to prog, rock to retro, and practically everything in between -- with results that have ranged from infinitely satisfying to absolutely stupefying, One of rock’s true chameleons, he seems to take pride in keeping his fans guessing from one album to the next. At age 66, Rundgren’s more indulgent than ever. His output has become ever more eclectic in the past couple of years, and in turn, more challenging than ever as well. While the results haven’t always been satisfying, he does deserve credit for sheer adventurousness. After establishing himself with the signature soft rock style that characterized early staples like “Hello It’s Me", “I Saw the Light” and “Can We Still Be Friends", it would have been easy for him to forsake the experimentation and reap the rewards that pop superstardom has to offer. Following on the heels of recent Rundgren releases that delved into hard rock, fearsome blues and radically redefined versions of seminal songs he produced for others, Runddans finds Rundgren testing his parameters yet again. A series of ambient soundscapes informed by all kinds of strange cosmic atmospherics and effects, it’s easiest one of the oddest offerings of his entire career, and given Rundgren’s vast eclectic repertoire, that’s no small accomplishment. 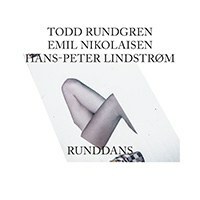 Runddans is the outgrowth of a collaboration with synth experimentalists and avante garde producer/composers Hans-Peter Lindstrom and Emil Nikolaisen, which, in itself, seems something of a revelation. Who are these two, and how was Rundgren enticed to share his skills with two musicians of such seemingly disparate standing? According to the press materials, the collaboration came about after Rundgren did a stomping remix of Lindstrom's track “Quiet Place to Live” in 2012 The trio then convened in Oslo, Norway later that year and the music grew organically from there. Rundgren’s always been an experimenter, so given the circumstances, no one should be too surprised at his willingness to take flight. Runddans has been described as “a spiritual magnusopus", but that -- whatever that is -- may be a euphemistic assessment. Despite the fact he's the only real marquee name here, Rundgren’s presence is mostly limited to some lyric-less chiming, and even those tracks -- “Put Your Arms Around Me” and “Altar of Kauaian Six String” -- the songs where his participation is most apparent, yield results that are, in an actual song sense, almost negligible. Fans of psychedelic soirees ala early Syd Barrett-led Pink Floyd will likely find satisfaction. As for everyone else, well, suffice it to say, drugs of another sort may indeed be needed.